Being a Bengali and staying in Delhi, it’s rare that I get to eat quality authentic Bengali food when dining out. 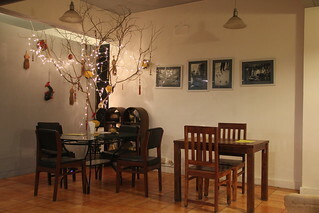 So it was a wonderful surprise for us when we dined at Bong Appetite at Qutub Institutional Area, Delhi. 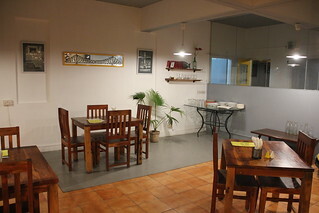 The décor of the restaurant is pretty good and has a very café like feel to it. The owner himself manages the kitchen and runs the place with great passion and enthusiasm. 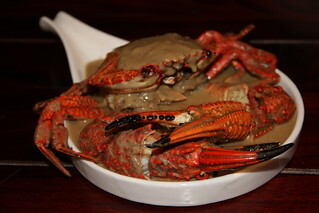 First was Crab Malai Curry paired with steamed rice, superb in presentation and wonderful in taste. The crab was wonderfully cooked, and the feeling of cracking open the shell to be able to eat the tender flesh was amazing. The steamed rice went well with the malai curry. 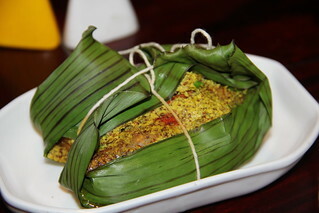 Golda Chingri Paturi came in next, which was king prawns marinated with turmeric paste, wrapped in banana leaf and steamed. Too good, and made me nostalgic, reminding me of the wonderful food of Kolkata. 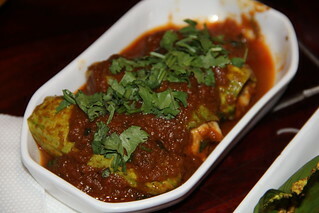 These 2 amazing dishes were followed by vegetarian fare – Potoler Dolma with Chena Stuffing which was pointed gourd (parwal in hindi), Allor Dum and Chollar Dal. I personally would never think of ordering parwal when dining out, but this dish was just too good! You’ll be missing something in life if you haven’t had this dish. Allor Dum was a traditional Bengali Dum Aalu, with mildly sweet gravy and tasted perfect and Chollar Dal is Channa Dal. 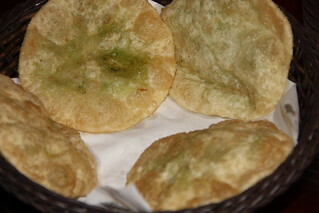 All these were presented with Luchi (Poori) & Kochuri (Grean Peas stuffed kachori) and I loved every bite of it. 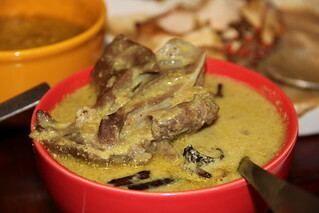 Mutton Rezala paired with Kolkata Laccha Paratha came in next and disappeared within minutes of coming onto the table. The paratha was crispy and flaky and the mutton – pure bliss! Completely filled with the amazing food spread presented in front of us, we couldn’t think of taking another bite, but when the chef presented his signature desserts – Mango Patishapta and Nolen Gur Ice-Cream, we couldn’t control ourselves. Bengalis are crazy after nolen gur, and we get it during a very limited time period. On asking with the chef, he told us that he had made a huge batch of nolen gur which would definitely last for some time – so my advice to you all, go ahead and grab a plate of this wonderful ice-cream before the stocks run out! All in all, it was a wonderful dining experience; the Bengali spread was wonderful and transported me to the by-lanes of Kolkata. The best part of the food was the hint of sweetness in all food items, but never overpowering it – which generally happens in many places. A place definitely not to be missed! Fasting during Navratri apart from being a widely practised religious custom is also a great way to detox. However, most Navratri menus are very high on calories and fat content which is not ideal for someone breaking a fast. Sodabottleopenerwala has a specially crafted menu for the festival which is simple and yet offers an inventive Irani cafe twist to traditional Navratri food. To begin with, Gwarfali which is almost never seen in restaurant food is glorified in these crispy cutlets cooked to perfection. The chef revealed how it is a very difficult vegetable to work with and the dish transforms an ordinary vegetable into a crunchy delicacy. The raw banana cutlets are another interesting addition. The light and airy Sabudana papad makes for the perfect accompaniment. In the mains, we particularly enjoyed the Khattu Meethu kaddu which has the right hint of spice and is cooked to perfection. This is served with a potato sabzi, kuttu atta rotis and steamed rice. The real highlight was the desserts on the set menu. The sabudana kheer garnished with mangoes offers the right degree of sweetness and is wonderfully creamy. The falooda is one of the restaurant’s signature desserts and is a flavoursome and fragrant concoction of strawberry and rose milk with icecream. 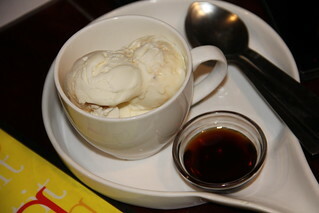 I felt completely light after the meal as none of the dishes were oily or spicy but managed to retain wonderful flavour. The menu really takes traditional Navratri/fasting delicacies and reinterprets them in classic Bawa style for a memorable experience. This one’s a clear winner. “Afterall, Life is delicious when you pull up the chair and take a taste” ! Once you step inside the Ambience mall, Vasant Kunj, you know it well enough that it’s going to burn your pocket,be it shopping or eating at a good restaurant. “Yauatcha” is one among the many, located in a corner of the second level of the mall. This restaurant does not require a second thought for their take on-“Cantonese cuisine”. So, let me give you a detailed insight to what this luxury dining has got for the rich class of people and for foodies who wouldn’t mind burning their pocket. Out of so many restaurants, I picked “Yauatcha” for the review for a stomach full and content dinner.We were however, swiftly escorted to our table by the nice courteous service staff member who even guided us through the menu. It’s dimly neon glow and dark facades are perfectly offset by the glass partitioning to one side that contributes to the restaurant’s airy vibe even by evening and has a long bar at the other end.It has a capacity to accommodate approximately 137 people and has the crowd of a good class of people. We barely had an interaction with them. Even the staff did not make an effort to attend us timely so after having placed an order and having done with it, we literally had to look here and there for the staff to make sure that he sees us and comes and takes the next order. The service was indeed very slow and even got frustrating at times which kept us at bay from ordering the main course and just being done up with their starters and drinks. This place will never disappoint you when it comes to their dim sums-ranging from steamed,pan-fried and fried being available in vegetarian and meat select and for a wide range of their drinks. We had ordered a glass of orange and chilli smoothie which was a good blend of orange juice,palm sugar,chilli,mint and lemon grass ( although,the lemongrass was not a necessity). We also ordered a glass of plum cut larissa smoothie which had grapes,plums,fruit syrup,oolong tea and apple juice in the right mix. 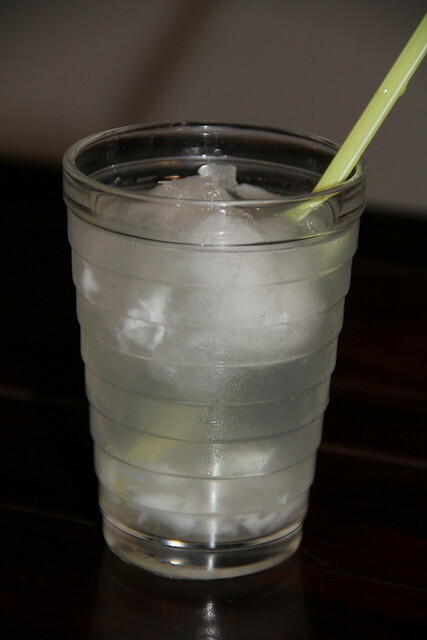 The virgin mary mocktail was indeed very nice. I have seen a very few restaurants come up with this drink as a perfection,apt for my taste buds. Overall, we were content with our drinks. We tried their Chicken and Prawn sui mai, vegetable shanghai Dumplings at first, which clearly reflected the artistry and silken touch that goes into making each of these babies. Each one of them looked stunning, made with the sure touch of a master craftsman. At the end we were presented with a curated dessert platter which included three flavors of ice cream, religieuse,six french macaroons, milk choco praline and mango mascarpone gateaux. Macaroons…Ahhh..those gorgeous,little French cookies-delicate and pretty. They were fluffy and delicious. And they were so super cute!They were perfect with not a single crack in any batch.They were fresh and delicate but too sweet for my taste buds. The milk chocolate praline, was my favourite (sure, it’s gonna be your’s as well…! ). The Sacher biscuit on top was a commendable way of presenting it. Very delicate and soft and dissolves in your mouth right then. Tempting and mouth watering…You need to get your eyes off it inorder to resist it. The religieuse, had a good presentation with a disc shaped on top having “Yauatcha” written on it but, was a little hard. Didn’t find it fresh and I would not like to go for another try of it. 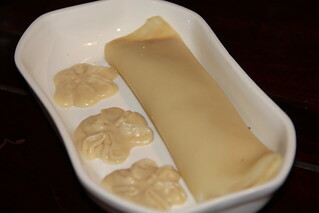 If you are having the crave for “Cantonese food” and like to try out their deep fried dim-sums, then you can give it a thought of burning your pocket. The service needs to improve and also the higher management needs to make sure that each and everyone there is attended properly. It might leave some of you with a content heart and happy taste buds but as for me, I was a little disappointed with some of their dishes and might think of considering it the next time. Highly Recommend: Chicken wrapped in pakchoi, Chicken and Prawn sui mai and milk choco praline. The music at the place is a great mix of bollywood and hollywood numbers and keeps you in an upbeat mood. All in all, it surely is a highly recommended place, and food and film lovers must give it a try. It has a great ambience, great music, and great food and you would not mind splurging your money on this one. A special mention for the entire staff, they are very cordial, courteous and attentive, which also means great hospitality.